The Hetzenberg Chronicles: The Margravate of Dunkeldorf-Pfühl: Leib Brigade. The elite force in the army of Dunkeldorf-Pfühl is the Leib Brigade. 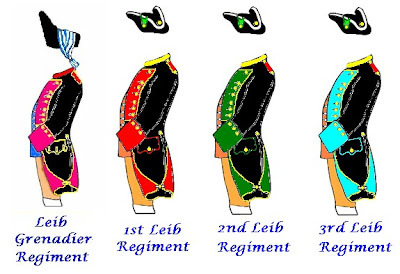 More often than not the Brigade functions as a purely administrative unit, each Leib regiment being assigned to one of the three line brigades as the resident elite force. If tough opposition is expected on the field of battle then the Brigade will be assembled. The Grenadiers always act as army reserve under the direct control of the general commanding. As a young lad I grew up watching old westerns . . . the ones where the bad guys wore black hats and the hero a white hat. Since everyone wears a black tricorn, it is only appropriate that the "bad guys" wear black coats, right? With lapels, cuffs and turnbacks of the facing color, Lace Wars uniforms cannot look grim, even with a black coat! While late Napoleonic Prussians e.g. managed to look gloomy while in blue and grey. Can one conclude from their respective grenadiers' headgear (& perhaps the size of the cuffs?) that Dunkeldorf-Pfühl is catholic and Hetzenberg protestant? You might say that, Jean-Paul. I couldn't possibly comment. In truth, where the ImagiNations are concerned I'm following H. G. Well's maxim of using totally fictional nations on the wargames. That goes for their religion too. Hetzenberg is "sort of" Protestant, and Dunkeldorf "kinda Catholic." The realities will be totally blurred and diffused. Striking uniforms -- simply striking! PS I do like the colors with the black--nice contrast.